November 4, 2015, New York City After leading his team to the World Series for the first time since 2000, the New York Mets have re-signed their skipper Terry Collins to a two-year extension. 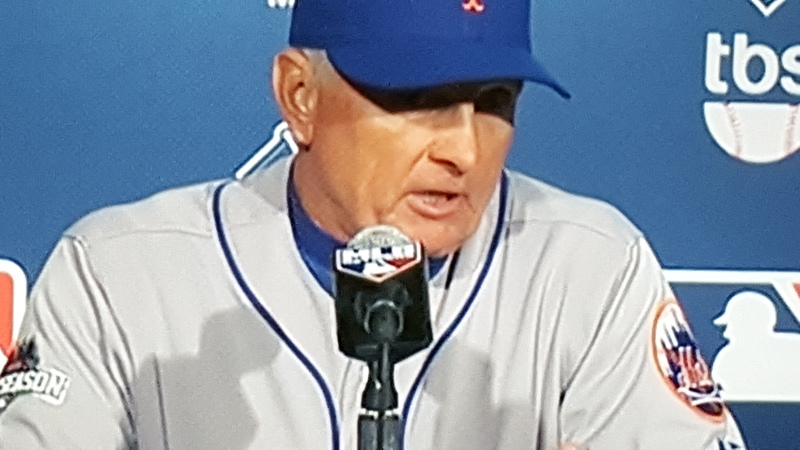 Terry Collins at age 66 becomes the oldest manager to take a team to the World Series. This is Terry Collins’ second two-year option the Mets have exercised. Collins joined the Mets family in 2010; he won 304 games with the Mets, which is the fourth most in team history behind Davey Johnson with 595, Bobby Valentine with 536, and Gil Hodges with 339. The Mets exercised his first option on September 30th, 2013. Terry Collins, who is getting a lot of attention for possibly being named Manager of the Year has led the Mets to the postseason for the first time since 2006, and to the World Series for the first time since 2000. Collins had to manage a team who finished the first half of the 2015 season last in every offensive category but in the top of the league with their pitching staff. The Mets only had one pitcher on their staff who had postseason experience but wasn’t even a starter. He played a major role in the bullpen, and that pitcher is Bartolo Colon. Collins had to handle many different situations on how to handle his pitching staff, as two of his five pitchers only have 1-2 years experience in both Jacob deGrom and Noah Syndergaard. Matt Harvey just came off Tommy-John surgery and was on an innings pitch limit count. As the games were getting more meaningful towards the end of the season, Harvey wasn’t able to give Collins the 7-8 innings that he normally would. Collins was able to get over the challenge and was able to work around his situation managing the bullpen properly. While the Mets were sitting in last in all offensive categories at the All-Star break, the Mets were sitting in second place in the National League East Division behind the Washington Nationals. Mets general manager, Sandy Alderson, went out at the last minute acquiring the former home run derby champion Yoenis Cespedes. Alderson would go out and make other key moves acquiring utility player Kelly Johnson and Juan Uribe. The final move Aldereson would make is bringing up their top prospect, outfielder Michael Conforto. The addition of those players helped Collins put together a winning lineup to give an extra boost to help raise their chances in making the postseason, and those moves paid off. Collins, who managed the Angels and the Astros in 1990, has never made it to the postseason in his entire career managing. This will most likely be Collins’ final time his contract will be extended as he is considering retiring after his last two years with the Mets.